Gladius soldier system: The German military embraces video game-style heads-up display technology. On Today’s Battlefield, Is Information More Important Than Firepower? Halo, Borderlands, Call of Duty, Medal of Honor, Battlefield, Metal Gear Solid—these kinds of games taught a generation to see enemies as red dots on a mini-map. 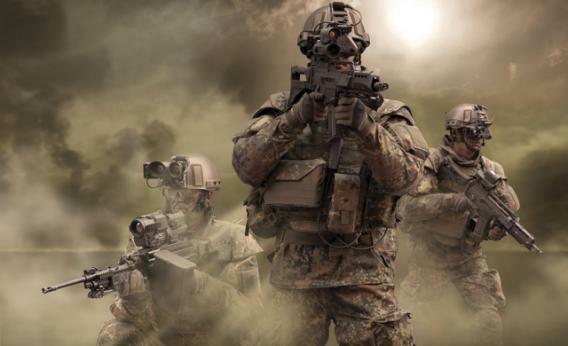 Now, today’s warfare is taking another turn toward the virtual with a highly advanced “soldier system” by the badass name of Gladius, which the German military plans to implement in Afghanistan as early as this June. The Gladius soldier system was developed by Rheinmetall, Europe’s leading supplier of systems for ground forces. (Gladius is Latin for sword, which was the go-to weapon of Roman foot soldiers.) Rheinmetall claims Gladius is the most advanced soldier system of its kind. So far as we know, Seal Team Six may not even have comparable hardware. The new technology represents a holistic approach to the modern infantry unit and a top-down philosophy in communication, targeting, and personal protection solutions. The most notable feature: the closest thing to a real-life “heads-up display” we’ve ever seen—like Google Glass for combat. Rheinmetall even makes these rather cool soldier identification devices so you can tell whether that silhouette on a rooftop is your buddy or a baddie. Every piece of technology is geared toward the rapid exchange of information and shared situational awareness—because on the battlefield, unknown unknowns get you killed. The notion underlying the Gladius soldier system is that a super-informed team of 10 is exponentially more lethal (and likely to survive) than an ill-equipped group many times its size. Though most of us are not likely to square off against flesh-and-blood insurgents any time soon, there are other—ahem—scenarios in which a set of Gladii may come in handy. Unfortunately, it’d cost almost $2 million to outfit you and nine of your friends for the imminent zombie apocalypse.